As the current saying goes, everyone is entitled to their own opinions, but not their own facts! No matter how tough you think you are or how good you think you are at hiding your emotions, buying or selling a home is an emotional affair. Even hard-nosed property investors will get at least a little miffed at missing out on a deal. When emotions take over, rational thinking can fly out the window…. My Zesstimate must be right, it’s a computer and it’s higher than what my Realtor said my home is worth! That $25,000 kitchen remodel increased my home’s value by $50,000! I’m not giving my home away for nothing! I’ll never get to buy a home, everyone knows that EVERY home is selling way over asking with multiple offers! That home is way over-priced. I’ll offer $20,000 less than asking (this despite there being 5 other offers). When buying or selling a home, it’s wise to get a grip on reality with real numbers. Q: What is the true market value of a home? A: It’s what a buyer is willing to pay for it. To find out what that magic number is, you have to list the home on the market. Obviously, that is not ideal if all you want is to know how much your home is worth. However, when a seller wants to list their home for a sale, a reliable and accurate assessment (as much as humanly possible) of the home’s current value is critical. The process for determining this is known as a comparative market analysis, aka a CMA. Your (hopefully competent) listing agent will look at recent sales of comparable homes in your neighborhood, make adjustments for differences between your home and those sales and come up with a best, educated estimate of how much your home is worth. The more educated / familiar the agent is with the area the better! That value generated is critical in setting the pricing strategy for your home. List too high and you are dead out of the gates and list too low and you could leave a bunch of moola sitting on the table. Ignore what Zillow or other automated online home evaluation sites are telling you. Mr. or Mrs. Zesstimate have not been inside your home, are completely unaware of any updates you maybe have done or repairs you may have neglected to take care of (deferred maintenance). Trust your agent and ignore the inflated (or deflated) Zesstimates. A wee observation: it’s funny how sellers never question a CMA that comes in higher than the corresponding Zesstimate. A buyer who wants to make an offer on a home can also benefit from their agent doing a quick market analysis. Buyers tend to think 9 out of 10 homes are over over-priced. Well, take a look at the numbers and recent sales and check what the reality really is. This answers the very basic question of which direction is the market is currently headed. Is it going up, are prices trending downward or are we just going sideways (flat). This will NOT predict what the market will do next. You are just looking at what the market has done over the past few months and years. You can look back 6 months after the fact and point out where the market changed direction but that is about it. Also, it is critical when looking at price trends to make sure to use a large enough neighborhood/city area to generate reliable statistics. Too many agents extrapolate great pearls of wisdom from completely unreliable data by focusing in on too small an area with few recent sales. Many real estate market reports are meaningless. What percentage of homes are selling over the list price? Also, what is the ratio of the sale price to the list price for recent sales? In a hot real estate market, most buyers and sellers tend to think that almost every home is selling for over asking price with multiple offers. The reality, however, may be completely different. Naturally, the best homes that are priced properly and marketed properly, will get the most buyer attention, sell quickly and for above list price. The best homes are the ones that every buyer wants. However, let's take the case of Ballard Seattle one of the most sought-after neighborhoods in the city. Seattle has had highest home price increase for the past 17 months straight (at the time of writing this). But if you look at data for Ballard. only half of the homes sold for over-asking. So that means that half of Ballard homes sold for list price or LESS than asking. Sellers can’t just throw their home on the market and expect miracles. This is a good example of not taking one big AVERAGE for a whole neighborhood. You need to break it down into the different segments. Armed with this information, a buyer who wants to compete for the best homes knows they need to be prepared to duke it out, otherwise, there’s no point playing the game. Alternatively, they can go after the lower lying, less competitive fruit. Sorry, but that is the REALITY! How long are homes taking to sell? This is the average time it takes for a home to get an offer, not the time between going on the market and closing. Also known as Days on Market. In a hot market, most homes will sell quickly. Buyers need to be aware that they can’t wait until the weekend to stroll over and take a look at the home. For the best homes, you have to jump on them as soon as they hit the market. 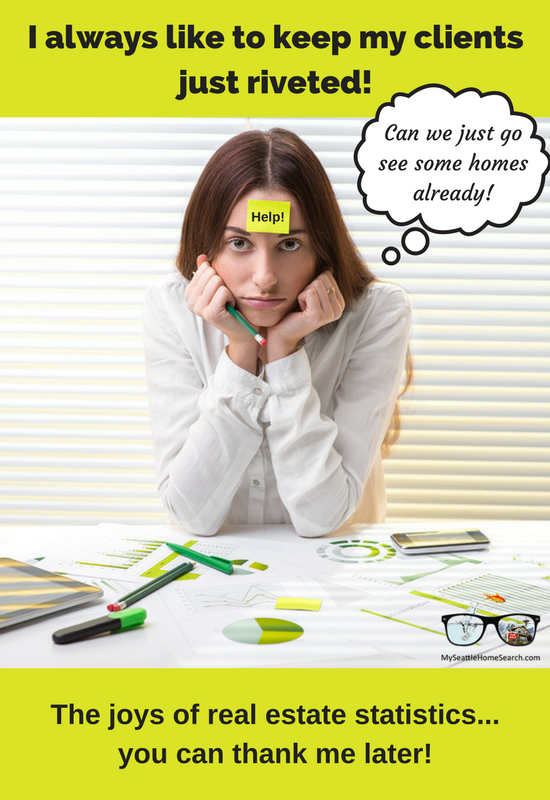 For sellers, for those homes that took a long time to sell, or failed to sell at all, well that’s usually because there was something inherently wrong with the home, or, was just plain over-priced. So Mr. Seller, now that you have that market data staring you in the face, do you really want to list your above market value? What’s the housing inventory like? This helps give both buyers and sellers an indication of how many homes are currently for sale and how quickly they are being snapped up/absorbed. The lower the value, the hotter the market. For example, when there are 4 weeks of inventory, this means that if no new homes came on the market, there would be no homes for sale after 4 weeks. A balanced buyer-seller market is considered to have 6 months of inventory. Different price tiers behave differently. First-time buyers make up the largest percentage of the home buying pool and they are focused on the “more-affordably priced" homes. Homes in this range will attract the greatest number of buyers and have the most competition. In general, many of these homes will tend to sell for a greater percentage above the list price plus they will sell more quickly. However, for luxury and high-end homes, the market is completely different. The number of buyers who can afford to purchase these homes is more limited. Many luxury homes can take a lot longer to sell, even in a hot market. Additionally, more of them will sell for closer to asking price or less. Buyers and sellers need to look at the real estate statistics for THEIR particular price range, not the overall market average. A million dollar home seller should ignore $500,000 listings stats, and vice-versa! How many homes are selling with all cash offers? OMG! Everything is selling for cash these days!! Overseas investors are snapping up everything with cash. The humanity! Yes, sellers love all-cash offers and buyers fear them. This is regardless of the fact that cash offers are not always the best offers. Plus plenty of times a financed offer will handily beat a cash offer. Many buyers will decide not to make an offer on a home just because they hear there’s a competing cash offer. That’s irrational thinking! Yes, some homes do sell with cash but the majority do not. Not everyone has buckets of cash sitting around. Step back and look at the numbers. What’s the reality? Have your agent look at recent sales and check what percentage actually sold for cash. Again, looking at Ballard Seattle real estate as an example, 11% of single family homes and 19% of condos sold for cash. Therefore 80%+ of homes were bought by buyers relying on a mortgage. So, no, the sky is not falling. How likely is the home to pass an appraisal? Woohoo! the home seller exclaims we accepted an offer for 18% over our list price! Rational thinking exits stage left! Unless that home was listed for less than it was worth, received a cash offer or a buyer who was relying on financing waived the appraisal contingency, then the sellers might need to step back and consider whether it really is a good offer. Why? Because a home that sells that much above the list price is at increased risk of failing the lender's appraisal. The seller might be told 3 weeks after accepting the buyer's offer that the appraisal did not pass. And now "we have a situation!". Although, strictly speaking, this is not a real estate statistic, BOTH the home seller and buyer should rely on a comparative market analysis (CMA, see above) when deciding whether a high offer could realistically pass an appraisal. An experienced agent should advise the seller that sometimes it is best to maybe go with the 2nd highest offer. You want to go with an offer that is the best combination of price and the greatest likelihood of going all the way to closing without problems. 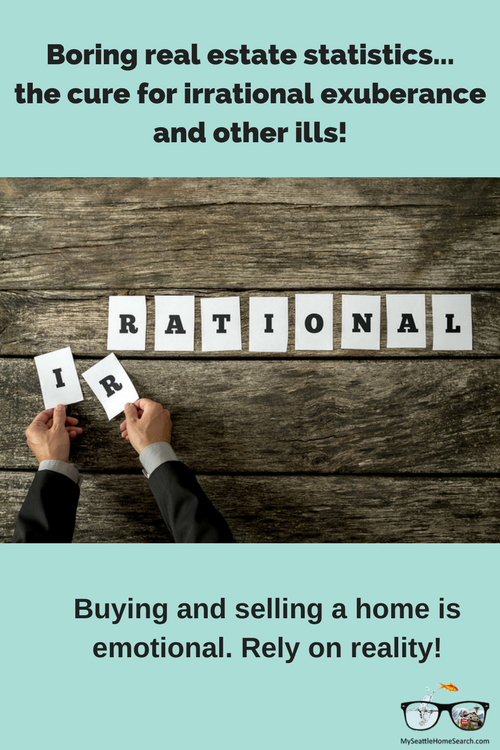 For both buyers and sellers, avoid irrational exuberance. When buying or selling a home, it's only natural that your emotions will be all over the place. However, you will be making critical financial decisions which need to be based on reality and rational thinking. 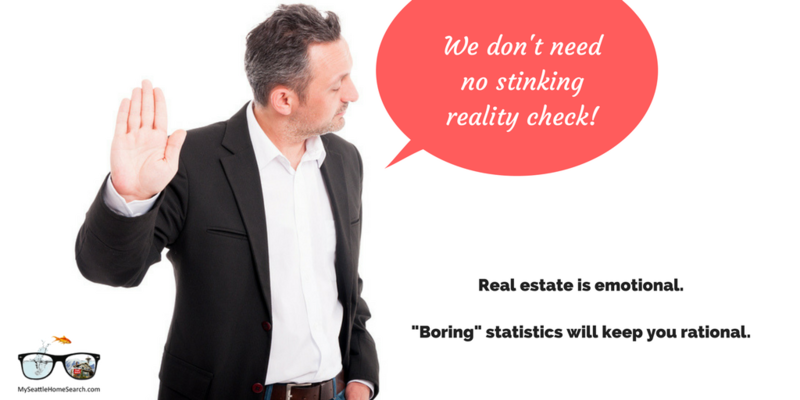 Embrace those boring real estate statistics and you will be a lot savvier decision maker. Ask your agent to show you the numbers. Days on market. What does it mean to a home buyer? from Kevin Vitali. Homeowners, are you unhappy with your Zesstimate? from Karen Highland. What does market absorption rate mean and how does it affect buyers? from Kyle Hiscock. Why real estate appraisals come in low from Bill Gassett.